Himalayan Voluntourism (HV) is a social enterprise dedicated to the socio-economic development of rural Nepal through the spirit of volunteerism. 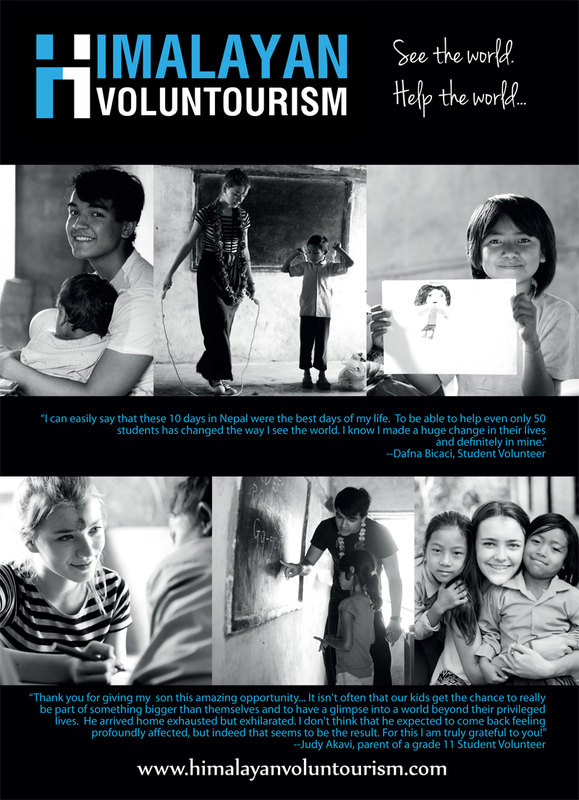 We believe in the power of transformation through voluntourism. Tourism is popular in Nepal and supports the Nepalese economy as an important revenue generator. Many tourists come to Nepal every year to experience its unique culture, adventure opportunities and the abundant nature. Combining tourism with social outreach provides a cultural experience that engages the participant in the local community… And it is transformative. HV provides wide range of volunteering opportunities in rural Nepal depending upon the interest and skills of volunteers and also the need of local communities. We provide a perfect package of community service and cultural adventure. Each year we connect groups of volunteers from international schools, universities, corporate groups, and gap year students with Nepalese communities. These are the people who believe that change is possible by getting involved in community work. Years of experience has shown us that community service through voluntourism helps rural communities as well as providing volunteers with a life-altering experience. Volunteers get the chance to explore themselves, which helps them define what they want to do in their own futures.